Having made the decision to be tattooed the after care is very important as to making sure your tattoo heals nicely. We have taken all the necessary steps to make sure your tattoo has been applied not only artistically correct but also hygienically correct, now the rest is up to you! Avoid swimming or soaking the tattoo for the first week. You may wash the tattoo daily in the shower. Definitely do not expose the tattoo to the sun for the first two weeks. Your tattoo will always look brighter if you avoid having them exposed to the suns harmful UV rays. If you must go in the sun apply a total sunblock, only after the tattoo has healed. ​Do not let anyone touch the tattoo while it is healing. 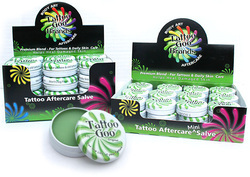 Apply TattooGoo cream 3-4 times per day for one week. Please take your time and feel free to ask us any questions. We would like this to be a positive experience for you because the rewards will last you a lifetime.